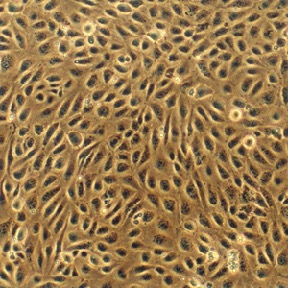 Bovine pulmonary artery endothelial cells (BPAEC) from Cell Applications, Inc. provide an excellent model system to study many aspects of cardiovascular function and disease. For example, they have been used to investigate critical signaling pathways and mechanisms relevant to proper endothelial function, such as angiogenesis, permeability and NO production. Others have employed BPAEC to search for beneficial modulators for therapeutic use, study diabetes-associated complications related to cardiovascular function, investigate mechanisms of endothelial dysfunction related to environmental pollution, smoking, oxidative stress and inflammation and search for potential treatments, and develop layered co-cultures of liver and endothelial cells that demonstrate superior liver-specific features. Kondrikov, D., C. Gross, S. Black and Y. Su. 2014. Novel Peptide for Attenuation of Hyperoxia-induced Disruption of Lung Endothelial Barrier and Pulmonary Edema via Modulating Peroxynitrite Formation. J Biol Chem, 289:33355-33363. Sherwani, S., S. Pabon, R. Patel, M. Sayyid, T. Hagele, S. Kotha, U. Magalang, K. Maddipati, and N. Parinandi. 2013. Eicosanoid Signaling and Vascular Dysfunction: Methylmercury-Induced Phospholipase D Activation in Vascular Endothelial Cells. Cell biochemistry and biophysics. 67:317-329. Sliman, S., R. Patel, J. Cruff, S. Kotha, C. Newland, C. Schrader, S. Sherwani, T. Gurney, U. Magalang, and N. Parinandi. 2013. Adiponectin Protects Against Hyperoxic Lung Injury and Vascular Leak. Cell biochemistry and biophysics. 67:399-414. Xing, J., Q. Wang, K. Coughlan, B. Viollet, C. Moriasi, and M.-H. Zou. 2013. Inhibition of AMP-Activated Protein Kinase Accentuates Lipopolysaccharide-Induced Lung Endothelial Barrier Dysfunction and Lung Injury in Vivo. The American journal of pathology. 182:1021-1030. Day, R.M., Y.H. Lee, L. Han, Y.C. Kim, and Y.H. Feng. 2011. Angiotensin II activates AMPK for execution of apoptosis through energy-dependent and -independent mechanisms. American journal of physiology. Lung cellular and molecular physiology. 301:L772-781. Matsumoto, A., H. Harada, M. Saito, and A. Taniguchi. 2011. Induction of insulin-like growth factor 2 expression in a mesenchymal cell line co-cultured with an ameloblast cell line. In Vitro Cell.Dev.Biol.-Animal. 47:675-680. Marchenko, A.V., E.O. Stepanova, A.V. Sekridova, M.V. Sidorova, V.N. Bushuev, Z.D. Bespalova, and V.P. Shirinsky. 2010. Novel peptide inhibitors of myosin light chain kinase suppress the hyperpermeability of vascular endothelium. BIOPHYSICS. 55:926-930. Mungunsukh, O., Y.H. Lee, A.P. Marquez, F. Cecchi, D.P. Bottaro, and R.M. Day. 2010. A tandem repeat of a fragment of Listeria monocytogenes internalin B protein induces cell survival and proliferation. American Journal of Physiology - Lung Cellular and Molecular Physiology. 299:L905-L914. Sliman, S., T. Eubank, S. Kotha, M.L. Kuppusamy, S. Sherwani, E.C. Butler, P. Kuppusamy, S. Roy, C. Marsh, D. Stern, and N. Parinandi. 2010. Hyperglycemic oxoaldehyde, glyoxal, causes barrier dysfunction, cytoskeletal alterations, and inhibition of angiogenesis in vascular endothelial cells: aminoguanidine protection. Molecular and cellular biochemistry. 333:9-26. Ohno, M., K. Motojima, T. Okano, and A. Taniguchi. 2009a. Induction of Drug-Metabolizing Enzymes by Phenobarbital in Layered Co-culture of a Human Liver Cell Line and Endothelial Cells. Biological and Pharmaceutical Bulletin. 32:813-817. Ohno, M., K. Motojima, T. Okano, and A. Taniguchi. 2009b. Maturation of the Extracellular Matrix and Cell Adhesion Molecules in Layered Co-cultures of HepG2 and Endothelial Cells. Journal of biochemistry. 145:591-597. Peltz, A., S.I. Sherwani, S.R. Kotha, J.N. Mazerik, E.S. O’Connor Butler, M.L. Kuppusamy, T. Hagele, U.J. Magalang, P. Kuppusamy, C.B. Marsh, and N.L. Parinandi. 2009. Calcium and Calmodulin Regulate Mercury-induced Phospholipase D Activation in Vascular Endothelial Cells. International Journal of Toxicology. 28:190-206. Mungunsukh, O., A.P. Marquez, Y.H. Lee, G. Thiel, and R.M. Day. 2008. Characterization of the bovine angiotensin converting enzyme promoter: Essential roles of Egr-1, ATF-2 and Ets-1 in the regulation by phorbol ester. Gene. 421:81-88. Ohno, M., K. Motojima, T. Okano, and A. Taniguchi. 2008. Up-regulation of drug-metabolizing enzyme genes in layered co-culture of a human liver cell line and endothelial cells. Tissue Engineering Part A. 14:1861-1869. Hagele, T.J., J.N. Mazerik, A. Gregory, B. Kaufman, U. Magalang, M.L. Kuppusamy, C.B. Marsh, P. Kuppusamy, and N.L. Parinandi. 2007. Mercury Activates Vascular Endothelial Cell Phospholipase D through Thiols and Oxidative Stress. Int. J. Toxicol. 26:57-69. Lee, Y.H., U.S. Kayyali, A.M. Sousa, T. Rajan, R.J. Lechleider, and R.M. Day. 2007. Transforming growth factor-β1 effects on endothelial monolayer permeability involve focal adhesion kinase/Src. American journal of respiratory cell and molecular biology. 37:485. Mazerik, J., H. Mikkilineni., V. Kuppusamy, E. Steinhour, A. Peltz, C. Marsh, P. Kuppusamy, and N. Parinandi. 2007. Mercury Activates Phospholipase A2 and Induces Formation of Arachidonic Acid Metabolites in Vascular Endothelial Cells. Toxicol Mech and Meth, 17:541-557. Mazerik, J.N., T. Hagele, S. Sherwani, V. Ciapala, S. Butler, M.L. Kuppusamy, M. Hunter, P. Kuppusamy, C.B. Marsh, and N.L. Parinandi. 2007. Phospholipase A2 Activation Regulates Cytotoxicity of Methylmercury in Vascular Endothelial Cells. International Journal of Toxicology. 26:553-569. Mohammed, K.A., N. Nasreen, R.S. Tepper, and V.B. Antony. 2007. Cyclic stretch induces PlGF expression in bronchial airway epithelial cells via nitric oxide release. American Journal of Physiology. 292:L559-L566. Hagele, T. 2006. Mercury activates phospholipase D in vascular endothelial cells: Implications for environmental cardiovascular disease. The Ohio State University, Honors Thesis. Day, R.M., G. Thiel, J. Lum, R.D. Chévere, Y. Yang, J. Stevens, L. Sibert, and B.L. Fanburg. 2004. Hepatocyte Growth Factor Regulates Angiotensin Converting Enzyme Expression. Journal of Biological Chemistry. 279:8792-8801. Ignjatovic, T., S. Stanisavljevic, V. Brovkovych, R.A. Skidgel, and E.G. Erdos. 2004. Kinin B1 Receptors Stimulate Nitric Oxide Production in Endothelial Cells: Signaling Pathways Activated by Angiotensin I-Converting Enzyme Inhibitors and Peptide Ligands. Molecular Pharmacology. 66:1310-1316. Jaimes, E.A., E.G. DeMaster, R.-X. Tian, and L. Raij. 2004. Stable Compounds of Cigarette Smoke Induce Endothelial Superoxide Anion Production via NADPH Oxidase Activation. Arteriosclerosis, Thrombosis, and Vascular Biology. 24:1031-1036. Chen, H., M. Montagnani, T. Funahashi, I. Shimomura, and M.J. Quon. 2003. Adiponectin Stimulates Production of Nitric Oxide in Vascular Endothelial Cells. Journal of Biological Chemistry. 278:45021-45026.